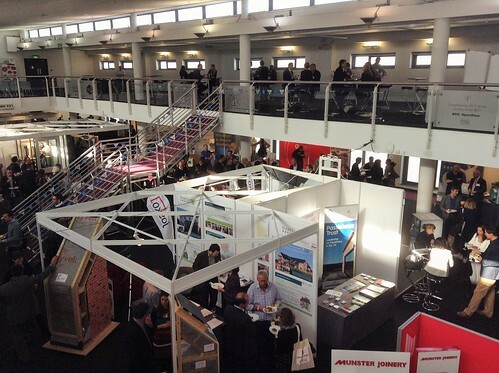 The 2015 Conference focused upon Passivhaus at large-scale, which was mirrored with a larger venue, larger attendance and a bigger conference buzz. The UK Passivhaus Conference took place on the 20th October at the Business Design Centre in London and offered an exciting and concentrated update of what happened in the UK Passivhaus movement over the past year. The one day exhibition and conference hosted over 30 exhibitors, models and demonstrations; which was attended by over 400 delegates. This year, the exhibition area was open to non-attendees of the conference in the afternoon (2pm - 5pm.) This is the first time that the UK's largest Passivhaus specific exhibition has been made accessible to the public. A full list of all sponsors, feature exhibitors and exhibitors and supporters can be found here. There were a number of interesting UK & Ireland case studies discussed, as well as Jessica Grove-Smith from the Passivhaus Institute, who was informing us of the future of the standard with new categories Classic, Plus & Premium. The full Conference programme can be viewed here and if you missed a session, slides (where available) can be accessed by clicking on the presentation titles. L-R: Jonathan Hines- Architype, Pete Warm- WARM, Tomas O'Leary- Passive House Academy, Gwyn Jones- Norwich City Council, Jessica Grove-Smith- Passive House Institute. The advice is emphasised every year, from design & construction detailing to building services - avoid over complication to ensure successful delivery and performance. As per previous years, it was great to hear a multitude of perspectives on Passivhaus projects from clients and designers to contractors and suppliers. Clear communication between designer and contractor was highlighted in a number of sessions regardless of scale, to eliminate the performance gap. Training, visual aids, along with regular site inspections helps maintain quality assurance. The standard has long been adopted in Germany and Europe. A number of speakers including Gwyn Jones, Norwich City Council, highlighted the benefits of visiting Passivhaus schemes already built, occupied and performing. Harness Passivhaus experience by working with people who already have the necessary skills and expertise. Delivering a Passivhaus is all about teamwork! Be honest regarding bad design decisions. 'Sharing knowledge means the industry can learn from mistakes rather than repeat them' says Pete Warm, WARM. This was echoed by Gwyn Jones, Norwich City Council, who says 'we should learn from each other.' Constructive feedback will facilitate improvement within the industry as a whole. The percentage that the Passivhaus industry has in the wider construction market is tiny, but its impact is massive. The UK Passivhaus community need to stop being so ‘nice’ and be more aggressive with data monitoring results - Short, sharp, and clear says Tomas O’Leary. Looking at a wider picture, Tomas O’Leary, Passive House Academy, asked 'what is the UK's plan?' The UK Government’s abandonment of decarbonisation and sustainability targets has reduced potential policy support for implementing Passivhaus as a viable solution to meeting Near Zero Energy directives, due to be enforced by the EU in 2019. Will the lack of policy support prevent Passivhaus from being adopted at scale, and is it more resilient to never become too reliant upon Government policy? What is important is to build upon the best practice that is already being put in motion by existing projects and create a UK supply chain which will improve cost-efficiency? The UK is on the right track. Keep it simple, deliver quality Passivhaus and showcase it. The official prize-giving ceremony honoured the winners of the Passivhaus student competition, sponsored by Tarmac, after the final panel at the Conference. Congratulations to Andrew Smith, Chenglei Sheng & Theo Scaramanga. Visit the Photo Gallery. Use Passivhaus from day one to inform and inspire every decision. Keep things simple to ensure they work. Support building users and monitor performance.